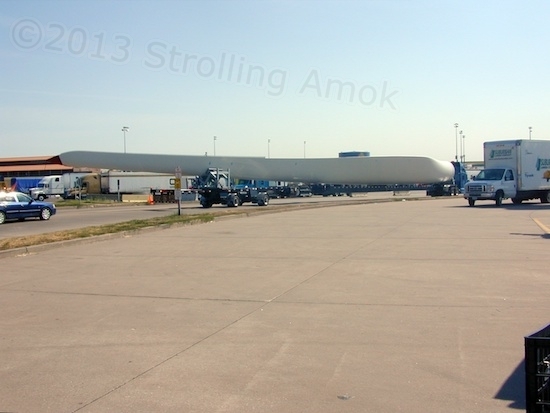 How do they transport those huge wind turbine blades? Very carefully. 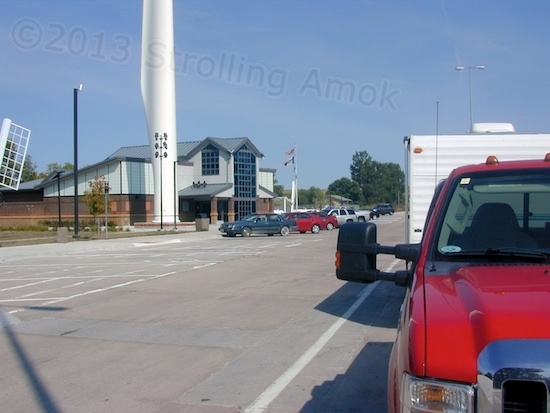 I snapped the above photo at the I-80 Truck Stop in Iowa, minutes before I left. I’ve seen several, and am always amazed at the sheer size of them. Wow. About an hour after starting out for a town park in Casey, Iowa my Garmin Nuvi started throwing alarms about stopped traffic ahead and rerouted me onto old U.S. highways. Then it complained about severe traffic backups and closed roads, and routed me tens of miles perpendicular to where I was wanting to go. That costs serious money in fuel. I turned around and headed back to I-80, finding that, in the end, it was all bogus. I ignored its dire predictions of closed roads, and barreled westward. Everything was fine, and I’d lost maybe 20 miles and $8 in wasted fuel on the multiple detours. I pulled in to Casey and found their town park, and was not impressed. The $5 boondocking fee had changed to $10 and said to check in with the nonexistent attendant. I felt uncomfortable there, and decided to press on toward tomorrow’s stop, some 200+ miles away. It would mean an arrival time of 7 PM, which I was okay with. Lo and behold, there was a rest stop a few miles down on I-80, complete with washrooms, and Wi-Fi, which is what I’m posting this with. I suspect there’s enough signal strength and bandwidth that I’ll be able to enjoy my repast while watching Netflix this evening! Is this awesome or what? Maybe this is a defective turbine blade here at the rest stop. I can’t figure out how such a costly item wound up here. So, I’m enjoying my afternoon drinky-poo while typing this at the desktop computer, and am looking forward to an evening’s entertainment perusing the atlases and watching a movie or documentary. Maybe something esoteric and intellectual, like Larry the Cable Guy. Iowa’s rest areas are awesome! Glad it worked out for you. It’s always good to listen to your intuition and when you feel uncomfortable, move on. It’s worked for me a couple of times when I didn’t like the feel of a place even though it looked fine. One time I found out later that they had had problems with some of the locals bothering those at that camp site. Thanks, Donna. Of course, the humorous reply is that what made me uncomfortable is that extra $5 they wanted! Though I tend to be overly rational, there are times when things just aren’t right for us. By the way, I’ve looked at your blog am am bookmarking it, because I’ve been there. I do hope things work out well for you, whatever direction that may mean. Yup, I’ll bet you have. I can throw down a few bucks as easily as anybody, but when I review how I spent money at the end of any given month, it can very quickly add up to amounts that will mean trouble down the road. Since I’m living off of savings for several years, every dollar counts. I like to think of it more as a challenge than a problem, though. My dad didn’t call me McDougall for nothing, I guess. Hoot mon, where’s my little coin purse? I believe most if not all rest stops in Iowa have wifi and most have dump stations. We leave for “the road” in jan wife is quitting her very good job,and heading as of now to TX for a couple of weeks then to AZ for rest of winter.Then to UT for family visit plans are to head to MT for the summer.Back to Pa in july for more family fun? Turns out the WiFi here requires a computer to be able to get onboard, so my gizmo that pulls movies into the TV was helpless, but the rest stops are still awesome. This one has plexi cubes distributed throughout the site, and at night, they all light up with changing colors. Quite a change from all the abandoned and closed rest areas in other states! I hope to be flitting down to Quartzsite and Yuma for the winter, so we may be in the same area sometime or other.